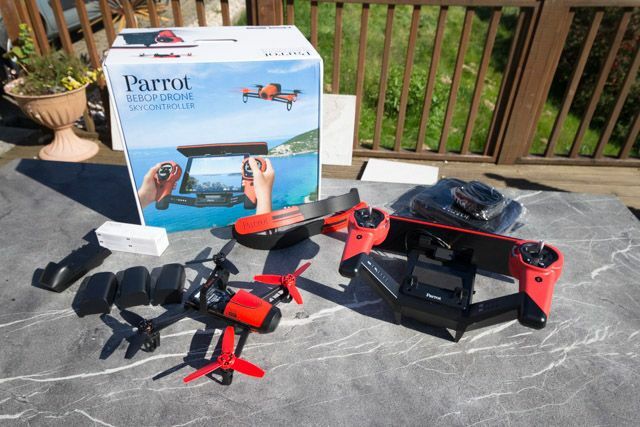 Soar through the sky and see the unseeable with fantastic aerial photos and smooth videos: this is the Parrot Bebop Drone and Sky Controller – and we’re giving away the complete set to one lucky reader! 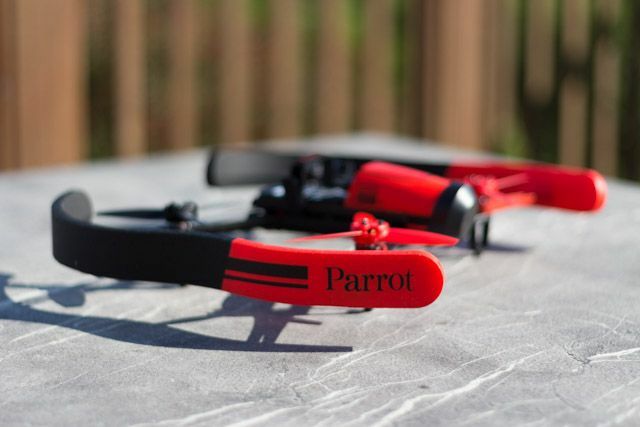 Parrot have carved themselves a mid-range niche in the drone market: too expensive to be called toys, but nowhere as costly as some professional models. Their newest flagship quadcopter – building on the successful AR Drone 2.0 – is the Bebop Drone, now available in a package with the new long range Sky Controller, for $900 (or more like $1200 if you’re ordering from Europe). That’s quite a price jump, so we have to ask if it’s worth it. The short answer is: maybe. Immediately out of the box, this feels a lot more professional that the previous generation AR Drone – the device is heavier, and though there are still some polystyrene bumpers provided for indoor flying, the body of the drone itself feels a lot more solid. I do have a few quality concerns about the Sky Controller though: the joins around the plastic were inconsistent, with half millimetres gaps on the left side. After about a day of use, the power switch fell off, and was lost. We’ve contacted Parrot for a replacement, though the unit is still operational without it, you’ll need little fingers or a tool of some kind to get at the switch. This isn’t consistent with the rest of construction though, which generally feels quite rigorous and hardwearing. 3 batteries (drone, controller, spare); all 1200mAh and all interchangeable. USB cable, iPad Mini / 7″ tablet adapter tray, tool for removing propellers, and carrying strap for controller. One minor frustration: while it’s great that they’ve included worldwide adaptors, the UK one is such that when inserted into a socket, the charging indicator LED points down, and is completely obscured unless you drop down to your knees and peer underneath. Considering there are three packs to charge, this is an annoying design flaw that could have been solved by placing the light on the front. 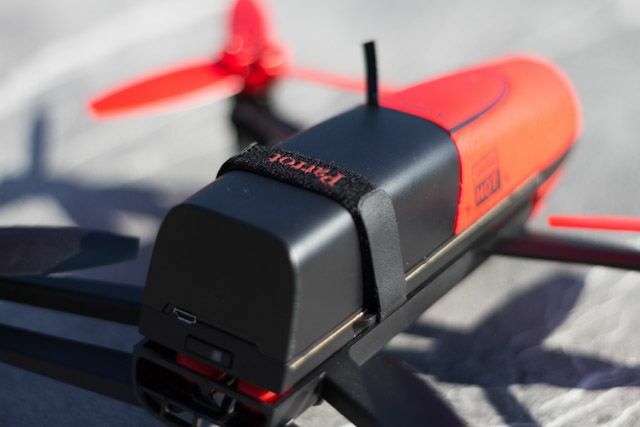 Like the original Parrot AR Drone and the Jumping Sumo minidrone, the Bebop can be connected to a smartphone or tablet running the Freeflight 3 app and controlled directly from there. In fact, if you buy the drone separately, this is the only way to fly it. The controls remain much the same, and you have the same choice of control styles as before (which basically comes down to absolute or relative position). However, the package we’re testing includes the new “Sky Controller” (also available separately in Europe, for €499), which claims to increase the range to around 2km with a huge aerial, good quality joysticks and a host of other indicators and features. It can either be used on its own, or combined with an iPad for the ultimate control out streaming video combo. The Sky Controller is huge and heavy (1.35kg), compared to the relatively small and lightweight (300g) drone it controls. The Wi-Fi aerial alone is wider than the drone at about 40cm across. With extendable mounting plates, it’s designed to accommodate a variety of tablet and smartphone sizes in the centre of the unit, while an array of LEDs on the bottom provide immediate feedback on controller battery, drone battery, and Wi-Fi signal status. Extending to either side are some metal joysticks for an incredible level of control previously only available to top end drones. The joysticks are quite pleasant to use, offering a counterbalanced center point and smooth motion. There’s also some shortcut buttons for land, record etc; and a set of thumbsticks for camera control, and to act as a pointer when used with the internal Sky Controller software and HDMI output. A sun shade is provided so you can see your tablet or mobile device’s screen while outside, but in practice I never had need of it. The delay inherent to sending video over Wi-Fi means you can’t fly by just watching the screen anyway, but it still has use for setting up shots and checking the angle of the camera before recording. 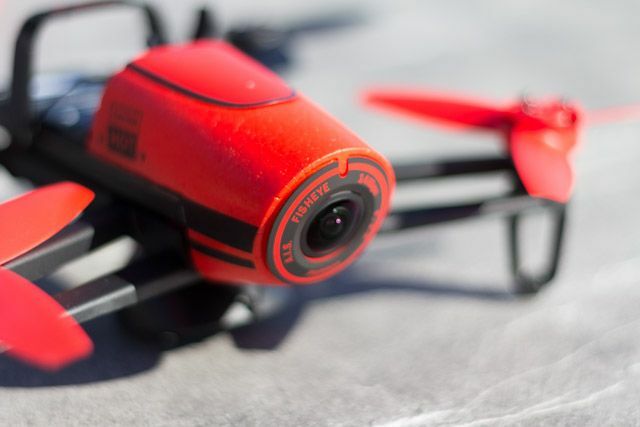 Sadly, the Parrot Bebop suffers the same problems as it’s predecessor, in that even the smallest amount of wind will cause horribly erratic behaviour. Don’t fly near to any tall objects or land you can’t access if there’s a light breeze: it will be carried along by the wind. At first I was also quite frustrated with the seemingly random plummeting from the sky that the drone would experience, until I found the setting for maximum height. 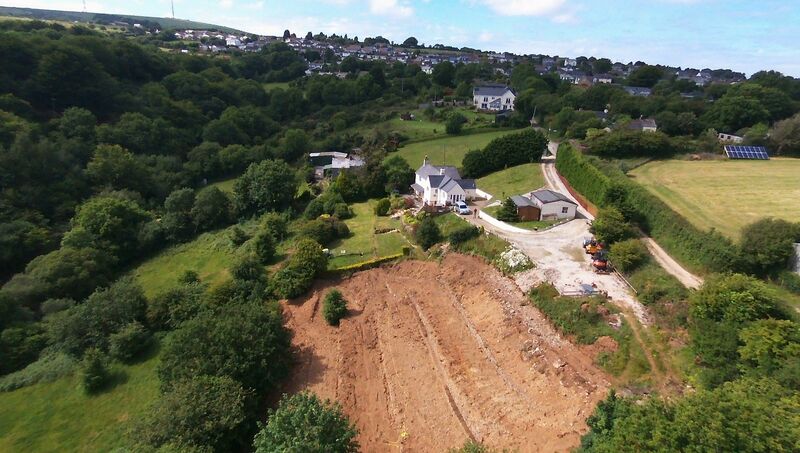 It’s possible that when flying on my rather hilly garden, the change in height was detected suddenly, at which it tried to correct it’s maximum height by dropping down (and into a bush). Once I’d updated that, performance improved considerably, and my screams of OMG NOT THAT WAY! *CRASH* were quickly replaced by confident excitement. Apologies in advance to the winner for the scuffed propellers – although it’s testament to the drone’s build quality that it was the only damage sustained by falling from the sky. I began by flying it close to the ground, fearing it would veer off into the unknown. That was a mistake. The small movements but unpredictable motions would often result in hitting walls or vegetation. There are propeller guards provided to avoid damage when veering into walls. But then I started to trust it more – to give it the freedom and height it wanted. It didn’t crash, it didn’t plummet to the ground. On one occasion a gust of wind sent it toppling over, but it corrected itself shortly after and suffered no damage. Generally speaking: you’ll need a large open space, not much wind, and definitely no animals or other humans, to fly the Bebop successfully. 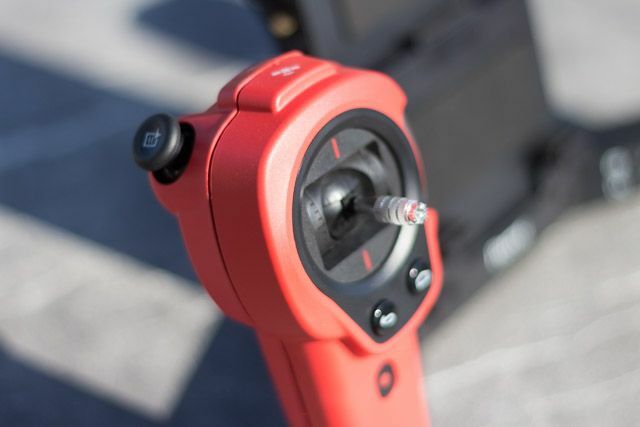 The Sky Controller certainly makes things easier – the joysticks have a pleasant amount of tactility to them, with a centre point bias that makes it obvious where you’re pushing at any time. The Bebop drone doesn’t have a gimbal to stabilise footage, but the camera is mounted on an anti-vibration plate, as well as a super wide angle 180 degree lens, from which it takes a portion of the image and stabilises it using software. The results, while not perfect, are still absolute stunning – much, much better than the previous generation Parrot AR Drone 2.0, and honestly far better than I was expecting. Click to view the full resolution sample image. You also have some degree of camera control – since it’s such a wide angle lens from which only a portion is being taken, you can pan around to achieve either a straight forward camera angle, or a more traditional down-facing shot. On the flipside of this, there’s no way to access the full wide-angle video stream: you can only get a stabilized portion of it. One small problem I found was that the camera defaults to facing forward, so without an output device like an iPad to accurately judge where the camera is currently pointed, it’s easy to forget this. This is very frustrating if you wanted aerial footage, only to find it’s been facing forward the whole time. Note: Transferring footage to a Mac requires the use of Android File Transfer program. On Windows you can just plug it in. Unbelievably, their promotional video still includes footage of an Oculus Rift being used with the Sky Controller, despite the fact that it has never, at any point, been compatible. The video is faked, and the Sky Controller remains incompatible with either the DK1 or latest DK2 Oculus Rift. To continue using it in promotional material is, in my opinion, downright deceptive. 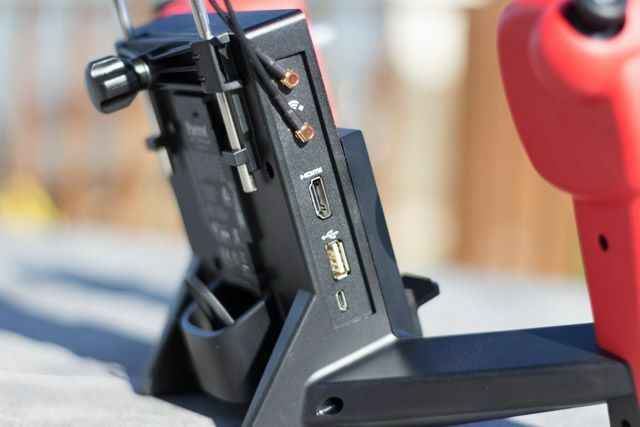 The Sky Controller is however compatible with regular First Person Video (FPV) glasses and headsets – the kind that simply take an HDMI input and don’t require any visual distortion or lens effects (which is why the Rift is still unsupported). Unfortunately, I don’t have one of those to test with. Supposedly, the USB input can also be used with head tracking gear to control camera position, but again, I don’t own any FPV glasses to test. You can even set a flight plan using GPS coordinates, but the box states that this is an in-app purchase – a disgusting money grab considering we’d already paid around $1200 for the controller and drone kit. Also: it’s not actually available yet, either. It’s great that they provide 3 batteries, because you will need them – and in a pinch, you can always yank it from the Sky Controller and use that one too, piloting instead from a mobile or tablet. Each battery is the same, 1200mAh, and in theory the stated battery life when used in the drone is about 25 minutes. I didn’t get nearly that much, but wind conditions will affect how much the motors need to be driven, so in practice you will often get less. Even on a perfectly clear day, I got 10 minutes at best. The Sky Controller in basic mode (no HDMI output, just as a controller) lasts significantly longer, and you’ll be able to get through a full few hours of flying and Bebop battery changes before you even need to consider swapping out the controller pack. Official extra battery packs are pricey, but you can buy packs of 2 slightly higher capacity 1600mAh third party compatible battery packs on Amazon for $50, which isn’t bad really. Grab those and you should be able to get 30 minutes to 1 hour of total fly time with your 3 spares. 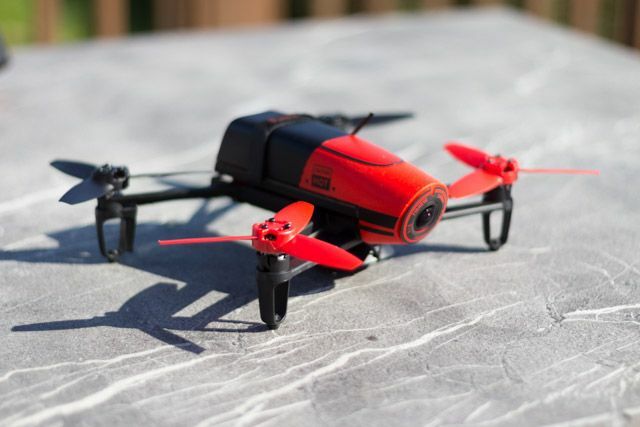 Is the Bebop drone and Sky Controller package worth $900? Maybe. If you have an occasional need for aerial photography and video (I can think of estate agents and landscapers, and that’s about it) – or if you’re just a well funded hobbyist – I don’t think you’ll be disappointed by what the Bebop offers. It’s a shame that some of the promised features like Oculus Rift support still aren’t in place though, and it seriously calls in to question the trustworthiness of the Parrot brand as a whole. 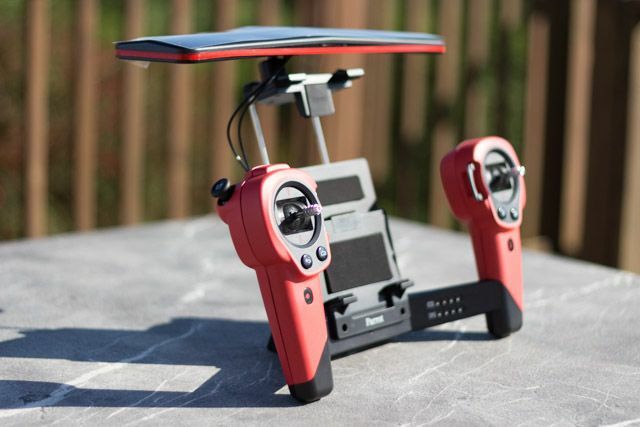 The Bebop drone and Sky Controller straddles a line between professional grade drones and toys. It’s a good stepping stone if you can afford it, but if you have even more to spend you should skip straight to the DJI Phantom 3 or Inspire models.